Angela Merkel said she wanted to be a chancellor "for all Germans"
Chancellor Angela Merkel has been returned to power in Germany, with forecasts showing her conservative bloc on course for a clear election victory. Mrs Merkel told supporters they had achieved "something magnificent", but said she wanted to be a chancellor of all Germans at a moment of crisis. Mrs Merkel's bloc now looks set to form a centre-right alliance with her preferred partner, the pro-reform FDP. She says the alliance will get Germany out of its worst crisis in 60 years. Projections by national broadcasters, based on partial vote counts and exit polls, gave Mrs Merkel's Christian Democrat CDU/CSU bloc 33% of the vote, with the Social Democrat SPD at about 23% - its worst result since World War II. The Free Democrats took about 15%, the Left party 12% and the Greens 10%. Analysts say the combined 48% for the CDU and FDP should allow them to form a stable majority government in Germany, Europe's largest economy and the biggest member of the European Union. It was the preferred outcome for both parties, though there are expected to be talks before a coalition is formalised. It means the SPD, which has been the junior partner in the "grand coalition" for the past four years, will be ejected from government. As exit poll results neared, officials and activists filled Christian Democrat headquarters in central Berlin, to eat, drink, gossip and of course speculate about the results to come. Then, drinks were set down and eyes turned towards TV screens. Chancellor Merkel's own party has done well but that's not what caused the great cheer here. It's the fact that the right-wing FDP looks like it has done very well, exceeding expectations. The left-right coalition, the so-called "grand coalition" between the Social Democrats and the Christian Democrats can now be consigned to history. Angela Merkel will still be chancellor tomorrow but overnight the political landscape will have changed completely. SPD leader Frank-Walter Steinmeier called it a "bitter day for German Social Democracy... there is no way of talking it up - the result is a bitter defeat". And he said it "would not be very sensible" to resign, vowing "to go on fighting". 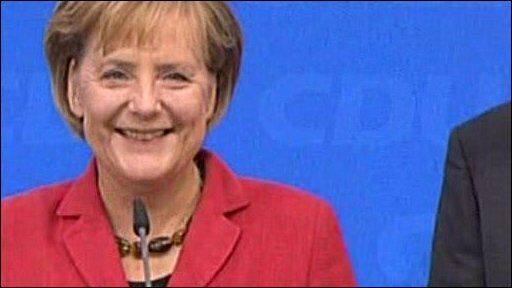 Although the results are not yet final, they were decisive enough for the leaders of the US, Britain and France to send their congratulations to Mrs Merkel. The result for her party actually looked like being a poor one historically - its worst since 1949. With turnout low, support shifted from the two main parties to the smaller ones. But the chancellor appeared delighted, as the new coalition line-up could give her a freer hand to pursue economic reform. "Our main objective has been achieved, namely a change of government, which for me is what really counts this evening," a smiling Mrs Merkel told cheering supporters in Berlin. "I want to be the chancellor of all Germans, so that things improve for our country, especially in such a moment of crisis." "I would not tell anyone to remain sober, but we don't want to forget that there are many problems in our country to be solved," she added. She said she would hold "swift and decisive" talks with FDP leader Guido Westerwelle, whom some are tipping as the next foreign minister. Mr Westerwelle said the new government would act "responsibly". "Now the work starts for real... for Germany and our people," he said.